6. More than one state machine? No problem! 8. Guards - use conditions in flow. 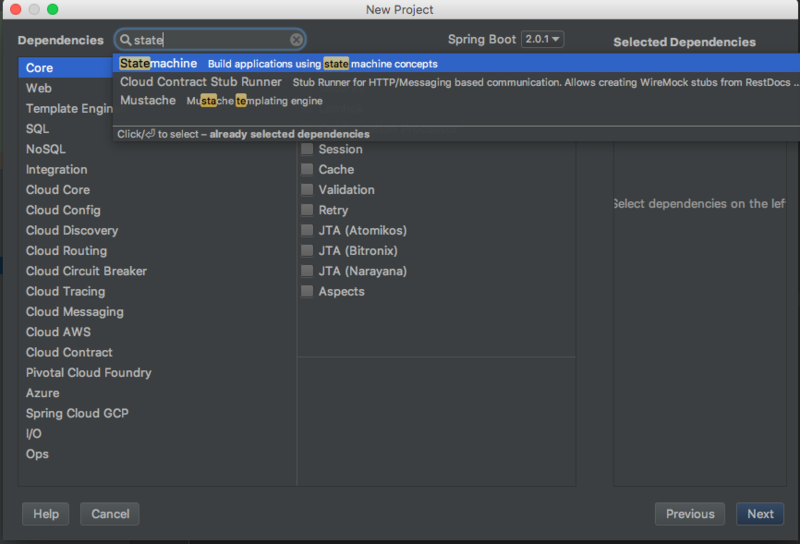 Create a new Spring Boot project and add the statemachine in dependencies. For example, consider the business process that is known to most developers - a software development lifecycle and Kanban methodology. If you didn’t hear about the Kanban before, then you should read about this methodology. You can find a many articles about it on the Internet. 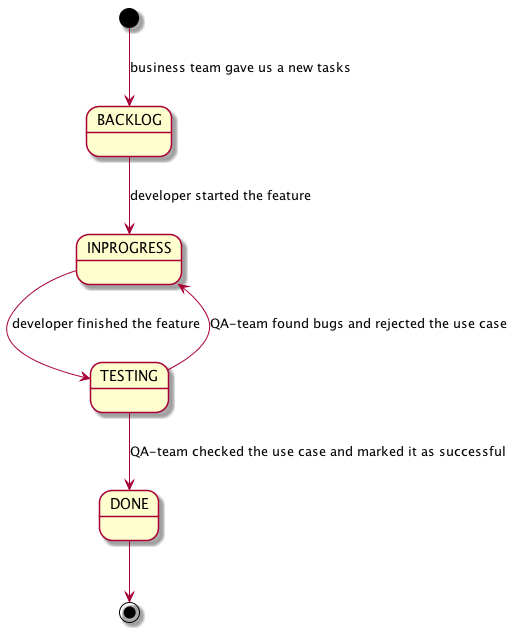 We can extract the following states from this business-process: BACKLOG, IN_PROGRESS, TESTING, DONE. This will be our set of states. The transition from one state to another passes by a certain event. 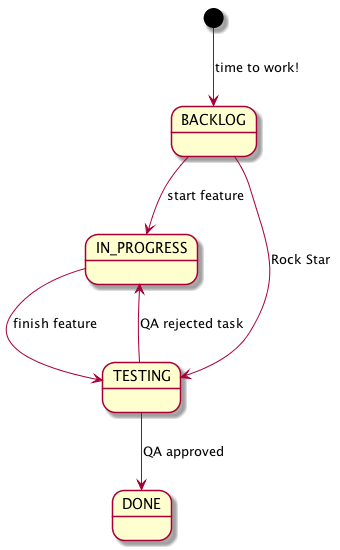 Also we need extracting set of events from the scheme: START_FEATURE, FINISH_FEATURE, QA_REJECTED_UC, ROCK_STAR_DOUBLE_TASK, DEPLOY, QA_CHECKED_UC. 1 we working with a type-safe, all of our states and events are described by the enums, so these types will be declared in the configuration. 2 override a base method for configuring the state machine. You need to specify the entry point to the state machine (the initial state) in the settings of states. When the state machine is start, the transition to this point will be the first. We set the autostart setting in the base configuration, then the state machine will start immediately in the initialization state. It is important to understand that the transition to the BACKLOG state from "nowhere" is also a transition, a little later, we will see it more clearly. Also, we specify the exit point (end state) in the configuration of states. Transition to this state will stop the state machine. The configuration of the transitional looks pretty intuitive, for each transition you need to specify the source state, the target state, and the event that will triggered this transition. 1 the main criterion for the successful completion of this test is the achievement of the "DONE" state. In a real test, it would be worthwhile to check each transition, not only the final state after a series of transitions, but for our research purposes this will be enough. This is a clear example of what I said before: the starting transition from "nowhere" to BACKLOG is also a transition. We should use the method ofNullableState because the source state in this transition is null. Change annotation @EnableStateMachine to @EnableStateMachineFactory, this provide us the ability to create a state machines from factory and we can inject the factory instead of a concrete instance. Let’s run the auto-deploy action after a feature finished. This approach has a one problem. If we slightly complicate our business process, then this action can be performed when it is unnecessary. For example, if a developer finished two features in the one pull-request, then he can transfer the second task to the TESTING state without run additional deployment. We hope that he did it because he is a super efficient, so we can call him a "Rock Star". 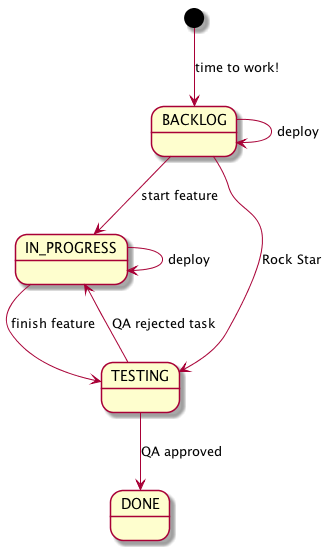 Now if we move a task from backlog to testing then will be run deploy. But we don’t want this behavior. We can see that the deployAction is triggered by any transition to the state TESTING. It provides us a more flexibility and allows to run actions by making a certain transitions. Next we will add the ability to run deploying from BACKLOG and IN_PROGRESS states. We will make DEPLOY as a separate event so that developers can decide when to do it themselves. But before going to TESTING, we will verify that the deployment event was called. For this we will create a guard on transitions to TESTING state. Add transitions for internal DEPLOY and guards for transitions to the TESTING state. Then we make a guard implementation based on the state machine variables. You can write in the extend state a lot of useful things that will be shared in a process. In this section, we will look at how to save and load a current state of the state machine in different storages. The process of creating a state machine immediately in a certain state is not easy, so that not to keep all the created state machines in memory all the time, we need a tool to save and load a state of the state machine by identifier. To start we make a simple (in-memory) implementation of the storage system. We used this kind of storage just for a demonstration. For a real application you need to prefer a more stable and complexity storage system. We need to store the context of the state machine, not the instance of the state machine. The StateMachineContext contains not only the current state, there are also stored variables that we write to the context. It provide ability to restore a completely identical state of the state machine. 1 Save the context of the first state machine. 2 Loading the context of the first state machine to the second state machine instance. Let’s consider an example of a real storage system for the state machines. We need to add a some dependencies for working with the MongoDb. Also we will write integration tests with TestContainers framework. Now we can make the integration test. In the specific asserts, we checked that the save was exactly in the MongoDB. We sometimes need to use a several different state machines in a single project. These state machines can have their own sets of states and events. In order to make a several state machines, you need to use a name on the declaration of the state machine factory. So, you can use a several state machines at the same time. Let’s look at the several alternative solutions without using the state machines. And consider their pros and cons. Of course, you can work on the organization of this code, you can replace the repeating logic and make a strategy for processing events, etc. But in the first approximation it is very difficult to maintain this code. It is difficult to track the logic of the transitions and their availability. Very poor code maintenance in the future. This is a good alternative, but a quite expensive. I will shortly discuss the cost of using the BPM in a project. First, you will need to deploy a full-fledged framework for a BPM processes in the project. These frameworks are not lightweight, not all of them work natively in the java. Secondly, you need to know the BPMN notation and be able to describing your business process by using this notation. If you have very complex business processes. When you need a lot of opportunities that provided by the BPM notation, such as: messages, subprocesses, signals, conditions on any transitions, etc. If you need a process versioning. When you need to visualize a processes by their code. When you need a tools to view and debug of all current processes and their states. If you have a very simple processes and a set of system states is obvious. If you have a little time to develop and(or) you don’t have a specialists in this subject area. If you do not need to manage a versioning of the processes.